Somebody pinch me I think I am dreaming!! It does sound like there's starting to be some encouraging progress over there Tom. And it's really good news. I suspect though that domestic violence will continue to be a serious problem there for a long time even now that they have this new law. But it's progress, that's for sure. this is truly monumental and historical and there should be a great deal of coverage on this in the media. it will be interesting to see if the usual suspects in reporting in america, cnn, fox, msnbc actually cover this and to what extent. 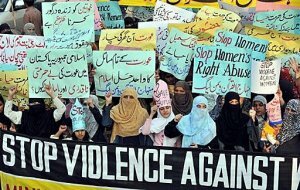 i applaud the men and women in pakistan for rallying for positive change in their nation to end what women have always known as a way of life.. The beginning of something positive! Thank you.